The Asgard have summoned all the Replicators to the planet Hala, where they had constructed a time dilation device that would entrap the Replicators for thousands of years. However, the device did not activate as planned, and Thor seeks the help of SG-1 to use the inferior technology of the new X-303 to penetrate Replicator space and reset the device. SG-1 reluctantly agrees, but on Hala they discover that the Replicators have used the device to speed up time, and have evolved into human form. The leader, First, explains that the six individuals have taken the names of the order in which they were created. The Replicators had exploited the design of their creator, Reese, and had since eliminated the flaw of compassion that appears in Fifth. Now they intend to use the time dilation device to allow themselves to create an army with which to conquer the universe. With SG-1 as their prisoners, they invade the minds of the team, forcibly drawing upon their thoughts and memories of other worlds. Fifth shows signs of sympathy toward SG-1, and although the team is unable to prevent the torturous and repeated probing of their minds, Carter volunteers to endure the painful process once more in order to access Fifth's humanity. 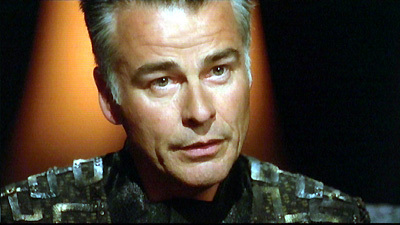 Fifth probes Carter's mind, and offers to help SG-1 to escape if they will take him with them. He makes the necessary alterations to the time dilation device, leaving Carter to set the timer. They allow enough time for each of them to return to the ship before activation, however, O'Neill signals Carter to alter the timer, leaving insufficient time for Fifth to join the team. To protect the galaxy from the Replicators, SG-1 is forced to betray Fifth and to use his humanity against him, trapping him within the time dilation bubble with the others as they make their escape. Hala was the first planet settled by the Asgard. A great battle was fought with the Replicators and most of the population was evacuated in time to use the planet to trap the Replicators in a time dilation bubble. The android Reese was damaged beyond repair, but the Asgard used her programming to call forth the Replicators, who used her superior technology to evolve to human form in the last moment before the Asgard time dilation device was to activate. Instead of blocks, they are composed of millions of microscopic cell units similar to nanites. The time dilation device created by the Asgard generates a field radius of .16 light years, creating a bubble in space within which time is slowed down by a factor of 10 to the 4th power. One year to the Replicators equals about 10,000 years outside the bubble. One hour equals more than a year. First reconfigured the device to accelerate time within the bubble by a factor of 10 squared, until SG-1 reprogrammed the device. First reaches into O誰eill痴 unconscious mind and reads the SG-1 iris code as 903224637. The president is #2 on Hammond痴 speed dial. His grandchildren are #1. The SGC serves Ben and Jerry痴 ice cream. O'Neill proposes naming the X-303 the "Enterprise"